The world’s only five-times distilled tequila saddles up for the fastest two minutes in sports. Oversized and over the top hats and fancy dresses aren’t the only things to make a big splash at this year’s Kentucky Derby. The Bonita Sprits Company and their celebrity partner hip hop star, actor, and now emerging entrepreneur Xzibit will turn up their ultra-sleek and luxury top shelf tequila, Bonita Platinum, in this year’s gift bags for several high society socialites and celebrities to enjoy. The Kentucky Derby is held on the first Saturday of May each year at the world famous Churchill Downs Racetrack in Louisville, Kentucky. For many professional horse trainers, owners, and jockeys the dreams of racing in the Kentucky Derby is the equivalent of the NFL’s Super Bowl which catapults the sport on a platform that has both national and international reach for the world to experience what has come to be known as the fastest two minutes in sports. “We are making some major moves. I’m just glad that we’ve had the type of positive response that we have had from those who’ve tried the product. I couldn’t ask for anything more,” states Hip Hop pioneer and celebrity partner Xzibit. Bonita Tequila first launched in Las Vegas, Nevada in February 2013 and held a star-studded red carpet event at Hyde Bellagio hosted by Xzibit where friends like Dr. Dre and Snoop Dogg attended and helped join in the celebration. 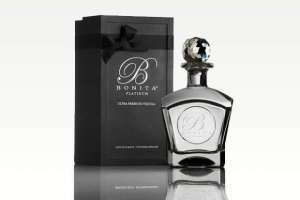 Bonita Platinum Tequila has made other appearances in high-profile gift bags such as The GRAMMYs® and OSCARS® gift lounges and on early morning shows such as Good Morning America. Bonita Tequila continues to receive monumental success and will also be featured on the upcoming cover of the Food and Beverage Magazine in their May 2013 which highlights Wines and Spirits. Additionally, the top shelf tequila was also crowned as the Best in the Nation by the publication in the tequila category. The Food and Beverage Magazine is the largest food and beverage publication in the country.